Iranians on Thursday are celebrating the annual Nowruz holiday that marks the Persian New Year and the arrival of spring. The holiday, dating back to at least 1700 B.C. 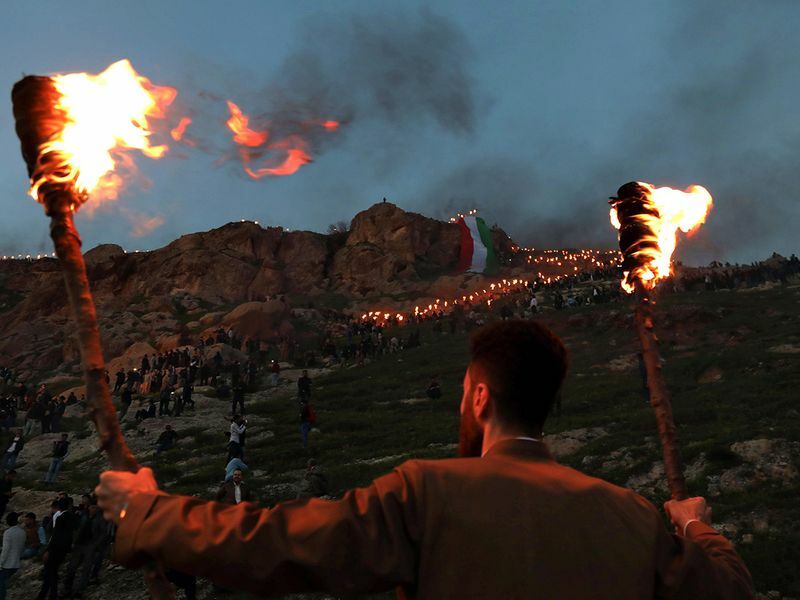 and is linked to the Zoroastrian religion, is the most important event in the Iranian calendar and is widely celebrated across the territories of the old Persian empire, from the Mideast to Central Asia. Many Tehran residents were busy shopping and preparing to host family and friends over Nowruz, which is celebrated Thursday. Street vendors pop up every year in crowded areas, offering lower prices. This year Iranian will celebrate with caution as they are facing an economic crisis in the wake of the U.S. pullout from the nuclear deal with Tehran and the re-imposed sanctions. Iran's currency, the rial, has plummeted, sending prices skyrocketing and wiping out many people's life savings. Iranians were in lines this week trying to secure some meat for their celebrations. Fatemeh Ansari Mokhtari according to a bloomeberg report, stood alone outside Tehran's Shahid Baharloo supermarket just after dawn. Hours later she was still there, now at the head of a long queue, as a refrigerated van pulled up and the driver unloaded Australian-reared lamb wrapped in white muslin. The 69-year-old was eligible for 3 kilograms of state-subsidized meat, her monthly allotment. "It's good we have this at least, otherwise what would we do?" she said. "It's bread and milk, too - the pressure is immense." Shortages, in meat, medicine, even gasoline in some regions, are spreading; proof, that President Hassan Rouhani's engagement with the West has failed. While Iran’s millennials see windows to the outside world closing. Other minorities from the Old Persian Empire who live in Pakistan, Afghanistan, Iraq, Syria and Turkey celebrate till today the festival of Nowruz. Nowruz marks for them the beginning of spring and the start of a new year. People of different faiths observe the holiday from Persian, Ismaili, Parsi and kurds. People would come together, wear new dresses, exchange greetings with each other, prepare special foods, decorate the houses and visit family members. Feasts will be around traditional cuisines that comes from ancient Persia and is seen as an important cultural and social link to Middle East. Traditional meals and desserts mostly are prepared with symbolic dried fruits and milk. 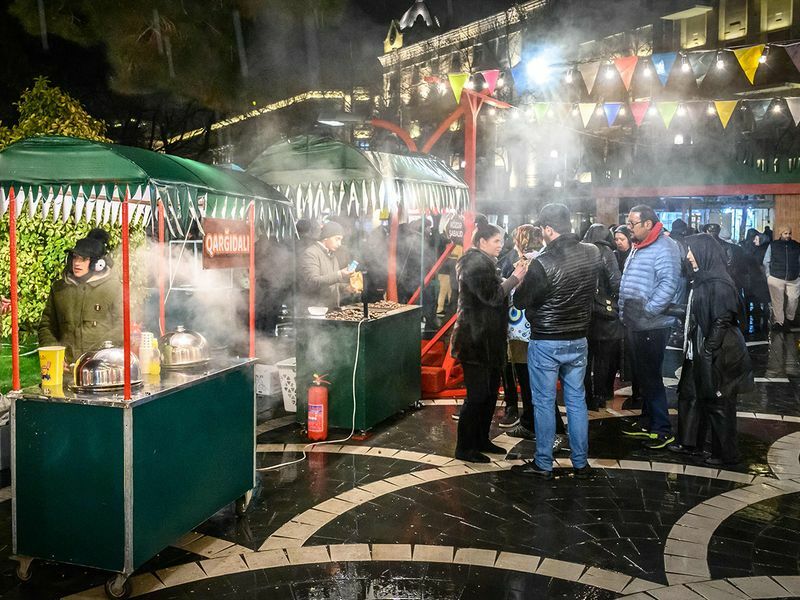 "Iranians love to celebrate, and they need it, especially now, when all of us are facing economic problems," she told AP "This is a way to forget these difficulties just for one night." 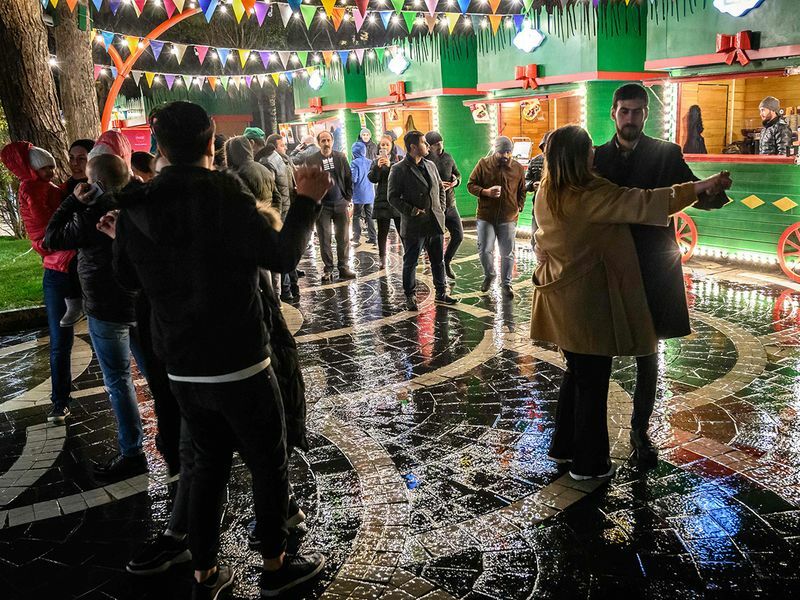 The holiday offers a rare opportunity for Iranians to dance and celebrate in public, something authorities usually frown on. Hard-liners discourage such celebrations, viewing them as pagan holdovers. The Western-allied monarchy that was toppled by the 1979 Islamic revolution had emphasized the country's pre-Islamic past, presenting itself as heir to a Persian civilization stretching back to antiquity. 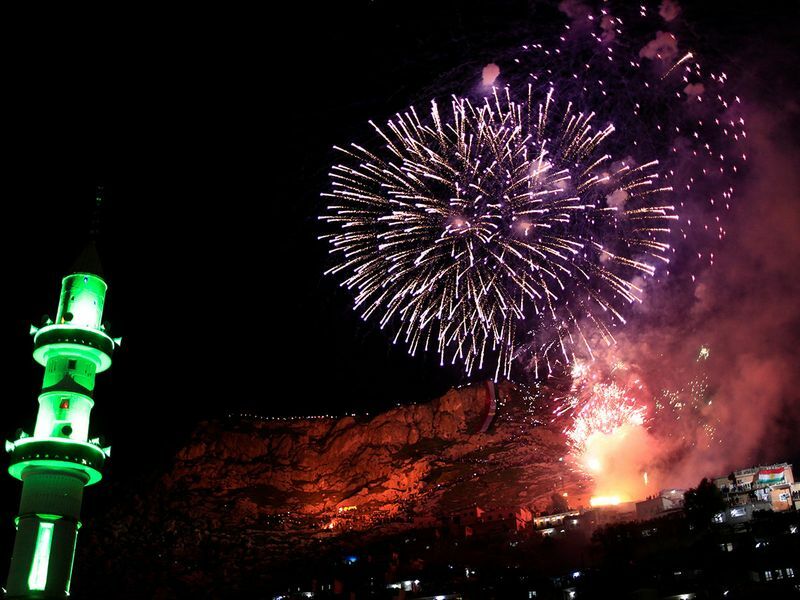 Iranians celebrate Nowruz for 13 days, starting March 21. 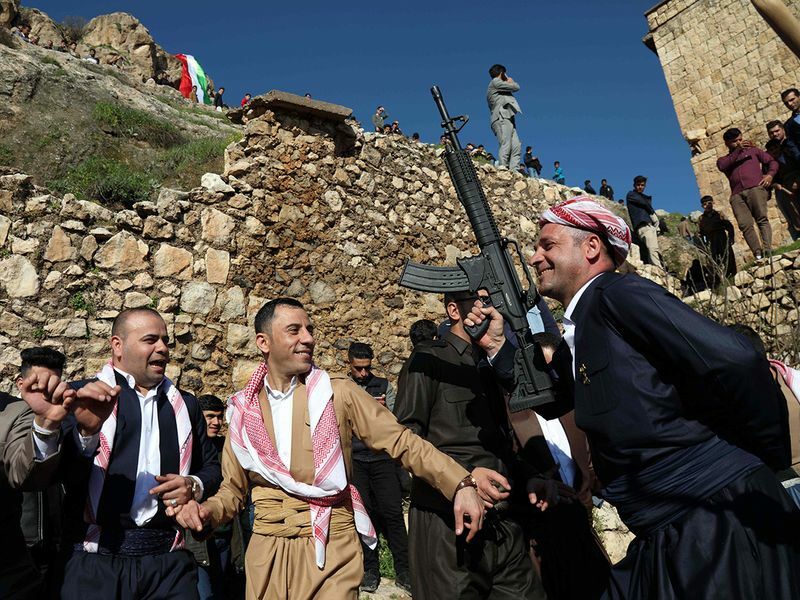 Kurds in Syria and Iraq on the day dress in traditional outfits color eggs, cook good food, light some bonfires and jump over them as they celebrate this unique day, in preparation of welcoming the spring season. 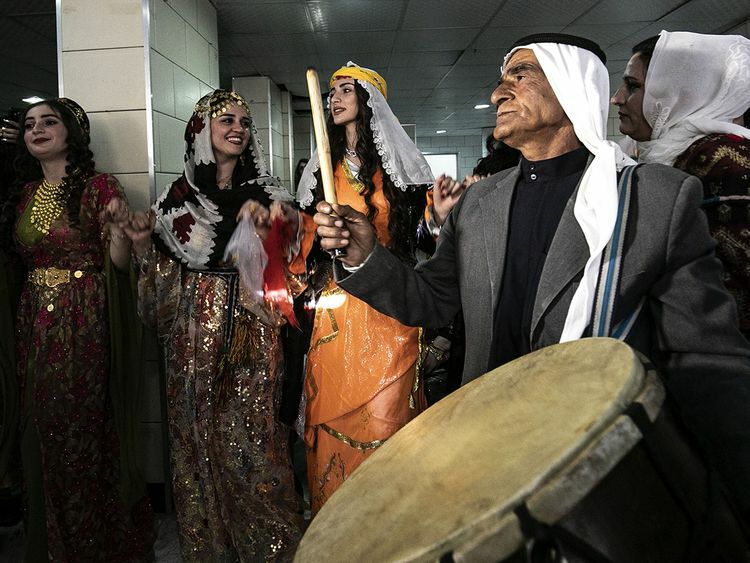 In Qamishly in eastern Syria the Kurds celebrate Nowruz, while in Afrin, Turkey is trying to ban the celebrations. Turkish authorities in the northern province distributed a notice in Turkish and Arabic saying that Nowruz was not an official public holiday and, as such, citizens would not be permitted to celebrate in any way. 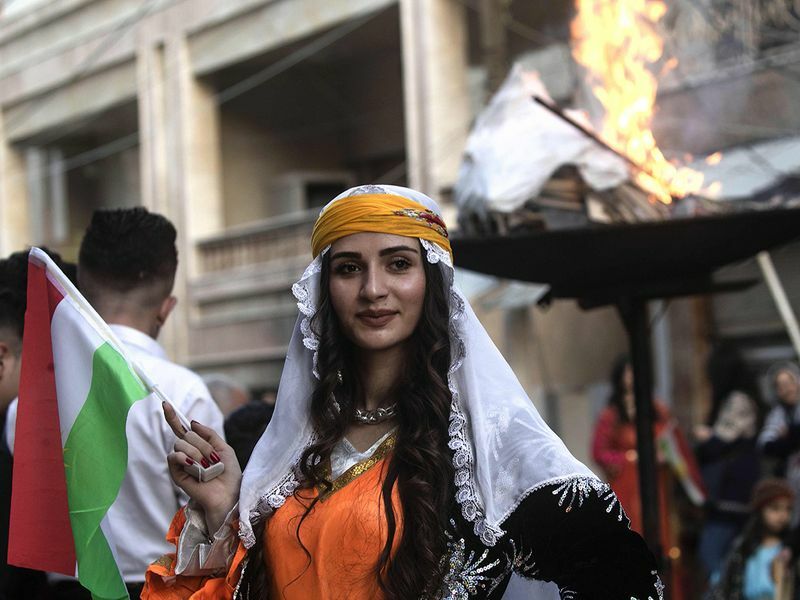 Kurdish celebrations of Nowruz in Turkey are a highly porhibited as the Turkish government often views the festivities as a manifestation of separatist nationalism.